Like many of you out there I have made a serious commitment to eat better and get in shape in 2010. However, there’s always room for a little indulgence, so I have decided to share this amazing bacon and caramelized onion quiche we ate on New Year’s morning. Healthy? Perhaps not. But there will be times this year when a little splurging is both necessary and deserved. So hop on your treadmills, bikes, and elliptical machines, drink lots of water, eat lots of vegetables, fruits, and whole grains—but please, I’m begging you, don’t forget to eat a slice of quiche every once in a while. 2. Line a pie plate or quiche dish with pie pastry, then trim and flute as desired. Prick pastry all over with a fork, then carefully line it with foil, gently pressing foil to bottom and side of pastry. Make sure edges are covered to prevent over-browning. Bake 10 minutes at 425 degrees. Carefully remove foil and bake 2 to 4 minutes longer or until pastry just begins to brown and has set. If crust bubbles, gently push bubbles down with back of spoon. 3. Turn oven down to 325 degrees. 4. Meanwhile, cook bacon until crisp. Pour out all but two tablespoons of drippings, then add chopped onion and shallot to the pan. Cook over medium-low heat until very soft and starting to caramelize. Chop or crumble bacon into small pieces, then add bacon and onions to bottom of pie crust. Top with grated cheeses. Whisk together eggs, sour cream and heavy cream, salt and a bit of fresh ground black pepper. Carefully pour the egg mixture into the crust. Depending on the size of your pie or quiche plate, you may have a bit of leftover liquid. 5. Carefully transfer the quiche to the middle rack of preheated 325 degree oven. 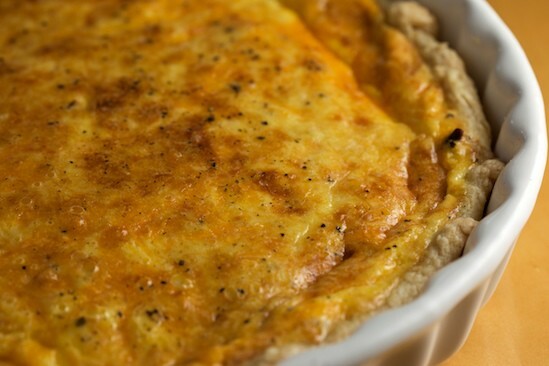 Bake for 45 to 50 minutes, or until knife inserted in center of quiche comes out clean. I have not yet finalized my New Years resolutions. Perhaps they should include, eat more bacon. oh lord, that quiche looks delicious. nothing like bacon to get the taste buds to wake up in the morning. 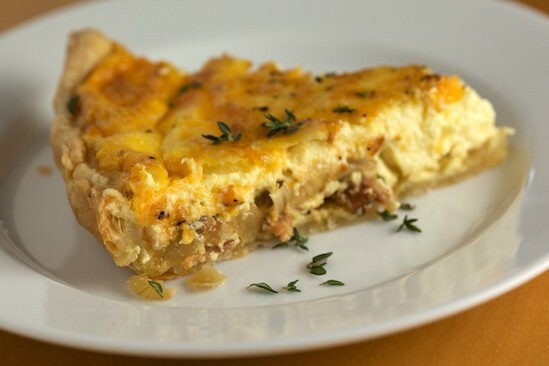 I like Pam's idea, I think it's all about balance, I want to eat healthier but I also want to eat quiche, bacon and the occasional donut!This quiche looks amazing. i was one of the lucky few who got to eat this as their first meal on New Year's day!!! it has the most heavenly consistency and omg was it freaking delicious! Lovely quiche! I can smell the bacon and cheese! Thanks! I think a bacon quiche is a wonderful way to start the new year. Thanks so much for linking to me from your fabulous blog. I haven't eaten quiche in ages. Thanks for reminding me how delicious it is. Need to get back to it! Happy New Year! One of my favorites. 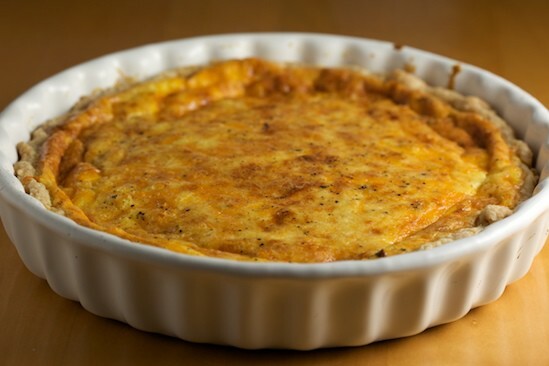 Yes - real men DO eat quiche.The same basic recipe (eggs and cream) can also make a custard or a flan. Yum - this looks awesome! Gosh, quiche is so under-appreciated. I'm really into it now that I have chickens and thus have eggs galore. Thanks for the recipe! Lots of protein! Calcium! Onion is....a vegetable! 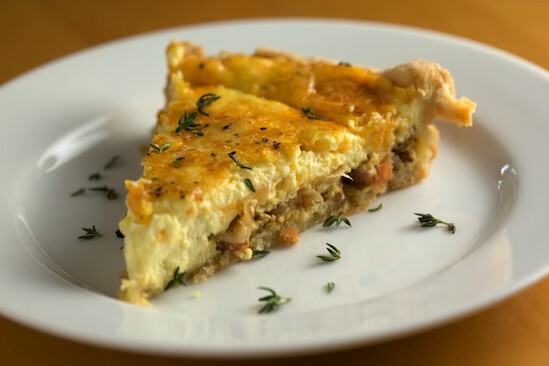 Quiche is health food, so enjoy, enjoy, enjoy!! !Thanks for giving me a recipe to make this weekend. I think there is room in my diet for a slice of this. Yum! This looks very much like the recipe my sister makes every year for Christmas brunch, and boy is it ever delicious! Great photos, I haven't had my (non-quiche for today!) breakfast yet and I'm drooling! You have such the right philosophy. You need a little bit of indulgence every now and then - even when on a diet! That quiche looks the ideal way to do it. I LOVE quiche and haven't eaten it in almost 10 years because my husband doesn't eat quiche. Agh.... men! I think I'm going to make some but just call it something else, maybe "egg pie" or something. I used to make it when I was pregnant and he's just look at me like he couldn't believe I was eating quiche. This sounds amazing! We’re currently looking for original and creative Mexican-inspired dishes for Cacique’s Go Auténtico Challenge (recipe contest), and this looks like a great recipe for it! You should really enter this recipe on the site: http://www.caciqueusa.com/goautentico/landing Just throw in a couple Cacique products, like Crema Mexicana instead of cream, Crema Mexicana instead of sour cream, and Chorizo instead of bacon and I think your recipe would do really well! The top four finalists will be flown to New York City in the beginning of December (all-expenses-paid) to compete in a nationally televised cook-off at Food Network Celebrity Chef Aaron Sanchez’s restaurant, for a chance to win a trip for 2 to Napa and 5-day culinary bootcamp at The Culinary Institute of America. I’m emailing you because we’re looking for more contestants with good recipes and I think this recipe has great potential. I tried ot make this. Not sure if I did it wrong or if the recipe was wrong?? Sfter following the recipr, I had a very large bowl of cream/egg mixture and minimal to no room on each pie plate. Was it something I did? Has anyone else experienced this? Thanks. Donny - Sorry you had problems with the quiche! As far as I can tell, the ingredient amounts listed are the same ones I used, but maybe your plate was much smaller? The ingredient amounts are enough to fill a large 10-inch pie plate or quiche dish, but you can use a smaller one - you'll just end up with liquid left over that can either be thrown out or baked separately in a small dish.